Indian railway is going to introduce mobile application to know food menu along with rates. This will help passengers from getting overcharged. ‘Menu on Rails’ app is developed by the Indian Railway Catering and Tourism Corporation (IRCTC). In case of Rajdhani and Shatabdi trains, where tickets booked include free food, the app will show the items available, so that passengers can check if something is missing when served. For express trains, the app will display items available and their rates, so that passengers are not overcharged. The app is available on Android and IOS platforms and is in the testing stage. It will soon be formally launched for passengers’. “It displays the menu of all types of trains running on Indian Railways where IRCTC catering on the trains is available,” the railway official said. Once you open the app, you will have to select one of the four train types — Mail/Express/Humsafar trains, Rajdhani/Shatabdi/Duronto trains, Gatiman Express or Tejas Express. “Based on the selection, the app will tell the passenger about the entitlement,” he said. A website is also being created by the railways which would be linked with the e-ticketing websites for providing information to passengers. 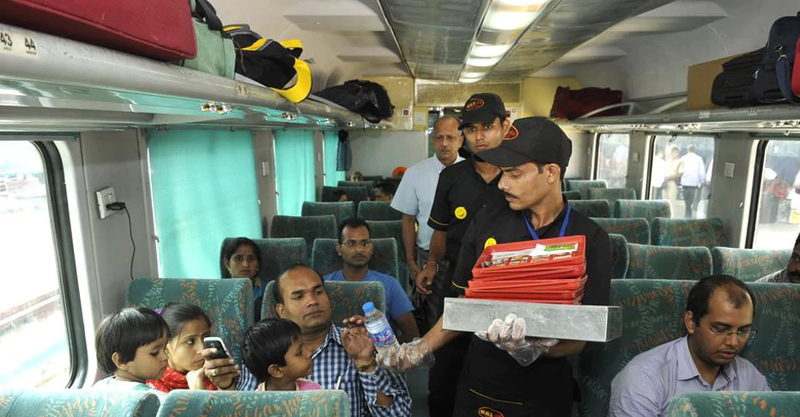 On April 12, railways minister Piyush Goyal, in a meeting with caterers, had told them to give the bill to passengers otherwise the food will be free. The minister has been meeting the caterers to address complaints related to overcharging. To check overcharging, the catering staff will have to use POS (point of sale) machines for accounting. According to a railway official, the minister told the caterers that they can have less variety, but needed to ensure higher quality. Minister has also asked service staff not to take tips and warned that those asking will be blacklisted.